All non-creature artifacts in play lose all their usual abilities and become artifact creatures with toughness and power both equal to their casting costs. 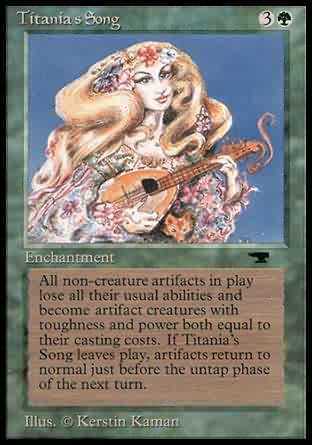 If Titania's Song leaves play, artifacts return to normal just before the untap phase of the next turn. Each noncreature artifact loses its abilities and becomes an artifact creature with power and toughness each equal to its converted mana cost. If Titania's Song leaves play, this effect continues until end of turn.